Guided tour of the Hélène de Beauvoir exhibition at Musée Würth on Saturday 1st September. On September 1st at 2 pm, the ESC is organising a guided tour in English of the Hélène de Beauvoir exhibition which is currently on show at the Musée Würth in Erstein. Hélène devoted herself totally to her art, painting. A demanding artist who knew how to make the most of the influences of her time. Between abstraction and figuration, the retrospective presented at the Musée Würth in Erstein shows the career of this committed feminist. 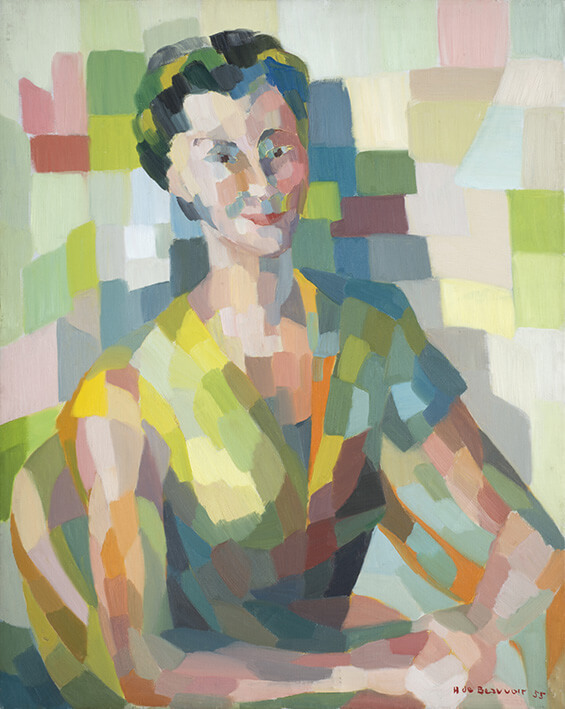 From her early years, when she experimented with printmaking and painting through the 1950’s, when her pictorial language evolved as her research initially took her in the direction of colour applied in flat planes and simplified outlines to her later years when her forms crystallised and the colour became divided, leading to the development of a unique language combining figurative representation and abstraction, with influences from both Cubism and Futurism. Hèlène was deeply affected by issues of women’s rights, environmental damage and political oppression. Her commitment to these causes was accompanied by the development of her own symbolic language. A must-see stopover for only 4 euros/person. To book your place, please contact rapidly Véronique Heller-Clauss at veronique.heller.clauss@gmail.com. as the size of the group is limited. And if you need or can provide a car-share, just let her know.